My Outside Voice: Meal Plan Monday and a weekend update! Meal Plan Monday and a weekend update! We had a super busy but really fun weekend. I DID get the lamps on Friday! SO excited and they look really cute. Of course I didn't get to take a picture of them yet, but hopefully this week. Friday night we had about 40 Twin Cities Wine Enthusiasts over and had a really good time. Lots of great wines from Willamette Valley, some great eats and wonderful conversation. I really love this group and I get so much out of it. Really fun, nice people and we have made so many good friends from this group as well. Saturday we had to get up early to go and drop my truck off to be serviced. My brakes had been acting up, and $600 later, I have new brakes and my car is in working order. It was $600 unexpected dollars, but we have a trip up to Duluth coming up and we will also be going up to the lake pretty soon here as well, so it was an important $600 to spend as well. We both had haircuts and a nap and then back to my house to get the place put back into order and to get ready for another wine event. This event was any wine under $10. It was out in Chanhassen which is a little ways out for me, but we had SO much fun. B & N who hosted us moved out here from CT in October. They have a beautiful home and the cutest 12 week old Golden Retriever puppy named Brady, SO darn cute. It was a really fun wine event though and our friends M & M were there and our friends C & P came with us as well. I love this group because it is actually a smaller group and we are able to go through and actually taste all of the wines, compare notes on them and really talk to the people there. I like both groups, but it is really nice to have that balance. Yesterday we met M & M for brunch at Crave. I enjoy Crave, and have always had good food there, and this was no exception. I like brunch in general anyway, and we had not tried brunch at Crave yet, so we thought it would be a good time to give it a try. It was served family style with scrambled eggs, hash browns (with cheese maybe in them, very good), a platter of different breakfast meats, sausage, bacon, ham, fresh fruit, a sticky bun, toast, a French toast bar, a make your own omelet station served along with orange juice, a mimosa or a glass of champagne. Overall, it was great, but one thing that was really poor, was the service. Before M & M even got there, I had to send my appetizer plate back because it was dirty. They never came back to replace it and I had to ask for another one. We were constantly stopping someone asking for things and our waitress just did not seem present. I am not sure why this was, but overall the service was just very poor. After hitting up Melly to check out the latest Lilly and pick up a couple of things, we decided to catch a movie. There were a few that we had missed the screenings on, so we decided to check out How to Train Your Dragon. We didn't get to see it in 3-D, but it was still an excellent movie and we just loved it. Great story line and I am sure it will be one that we will add to our collection. After the movie we headed back to my house to change before heading to his parents for dinner (which we didn't have because we were still full from brunch and they were out and about busy). I have been reading the book The Help and I just love it. M started a book club a few months back, and while I have been reading along with each of the books, I have been so busy with league stuff, that I haven't been able to make it to a discussion yet. I started it yesterday morning when I woke up and I am already over halfway through it. I can't wait to get some more reading in later tonight. I also picked up The Book of Joe on Friday for another book club. So far we don't have a ton of plans for this weekend, so hopefully it will be another good reading weekend. Last night we watched the second to last episode of The Amazing Race for this season, and I was really bummed to see my detectives go home. I think the season finale will still be really good, and I am REALLY hoping the cowboys win, but I think everyone is! Busy week this week, literally no cooking at all unfortunately, but hopefully after next week League stuff will dial down for a couple of months and we can get on a better schedule. I don't even know when we are going to be able to fit walks in this week, but I may take advantage of our indoor mile track here at work a few times when I can. Dinner - BBQ potluck, I am making the pulled pork that I made for Easter Sunday, SO good! Dinner - I will post the menu tomorrow! Plans - we had talked about catching the Twins at the new stadium, but we will wait to see what the weather is like. Plans - Our parents are coming for brunch, I have not finalized the menu yet, but when I do I will post it! We are also taking them to see a screening of Letters to Juliet. We loved the movie and I know they will too! We haven't gotten our mom's gifts yet, not sure what to get them, I will have to brainstorm this week! 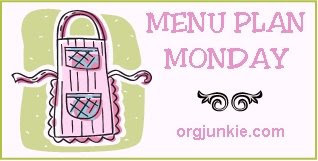 For more meal plans, recipes and other great links, check out the orgjunkie!